Click the fleein' toad above to learn more about The Great and Powerful Toad. This looked like a good spot to put all the things that didn't really fit anywhere else. Odds and ends for everyone. The fine shirt to own and wear. SOLD OUT! Get your new & improved FREE pre-addressed SAVE TOAD postcards. It's easier than writing your own letter. And they're green! ALL GONE! Download your own FREE Save Mr. Toad's Wild Ride flyers and spread the word all over your town. They look great, but watch out for that treacherous pointy pin! SOLD OUT! Now that The Ride is closed, Disney is finally offering some Toad merchandise. Back in stock! Act fast if you want one! Who paid for all this stuff? Reports of the previous Toad Ins at Walt Disney World. JT meets Terry Jones (star of 1996's The Wind in the Willows and Monty Python) and is given a new quest. 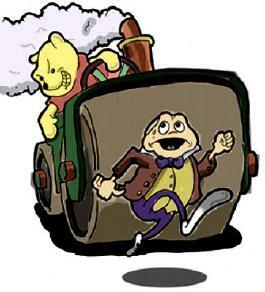 The best reason to save Mr. Toad's Wild Ride! The easiest way to find your local Disney Store, so you can call or visit and suggest that they carry Toad gear. E-mail JT to join the mailing list, submit a comment to the Electronic Toad Hall, or just share useful information about J. Thaddeus Toad and his home.